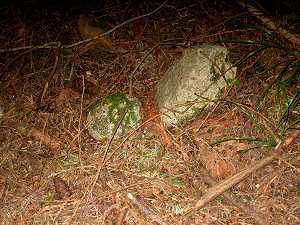 ---- The rocks in the San Juan Islands are a mess. They look like the scrapings in our galley sink after a three-course meal - and that's written by a geologist. However, truth told, they are a fascinating mess - and they are the scrapings off a plate - an oceanic plate. --- T Like any good bedtime story, let's begin with once upon a time. Way back in that sea of time, a wonderful story was being written. However, the first 90 pages of the 100 page tale are missing - ripped out by the capricious hand of erosion. So, we must begin our tale on page 91, about 450 million years ago. Back then, life was so primitive (clams, trilobites, and such) that we call that era the Paleozoic, the time of 'old life.' 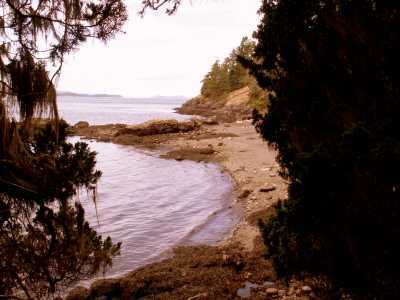 High up on the shoulders of Turtleback Mountain, on Orcas Island, you can scrape under the forest duff of pine needles and moss and find limestones teeming with fossils - sea shells and tropical corals. -- T What a contrast to the scene around you today - back then, those limestones were forming near the equator, in a shallow sea studded with coral atolls, under a hot equatorial sun, with beautiful maidens swimming in the warm waters - whoops, sorry, got carried away - mammals hadn't evolved yet. This idyllic scene of limey banks and sandy shores continued for about 250 million years, give or take a few weeks, and then, like always, the good times came to an end - the yang followed the yin. 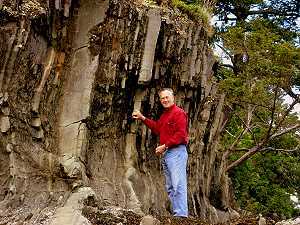 --- T If you keep exploring the highlands of Orcas Island, but now poke around under the cedars up on Mount Constitution, you will discover dark, rounded hunks of rock - lava! --- T Two hundred million years ago, sands and limes of the shallow sea floor rifted. Molten black blobs of lava heaved out of the vents onto the ocean floor. Subsea lavas, cooled quickly by cold water, shrink and congeal into pillow-shaped mounds. 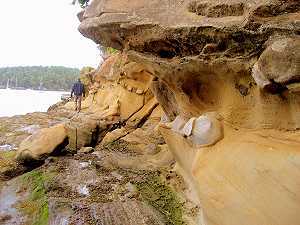 These pillow lavas can also be seen on the southwestern shores of San Juan Island. Some of the volcanic outpourings heaped high enough to become islands, rather like those of the South Pacific today, surrounded by coral beaches … ah, the strains of a slack-key guitar and the gentle swaying of hula skirts, under a languid blue tropical sky … Anyway, back to the story. 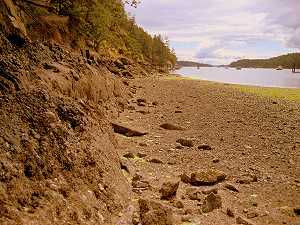 The limestones formerly mined at Roche harbor and near Lime Kiln Point on San Juan Island had their origin during this time of alternating lavas and shallow seas. --- T Yes, the Bard was correct, when he said the whole world is a stage - but he left out an important part - the stage is moving! Like her human inhabitants, Earth is a restless place. Seething molten rocks lie only a few tens of miles below our feet. Convecting the interior heat of the earth toward the surface, the magmas below seeth and surge like a cup of hot cereal starting to boil on the stove. The thin solid crust we live on is broken by all this commotion below, and the pieces get shoved this way and that. 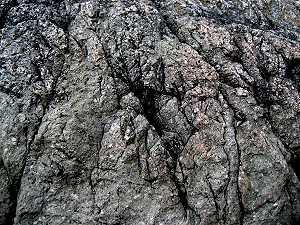 Where the surface breaks, molten iron-rich sub-crustal rock is heaved up into the fractures and hardens as black basaltic lava. 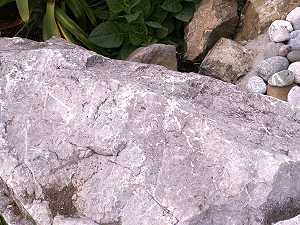 The lighter-colored and lighter-weight crustal blocks are forced aside by the newly-cooled black crust. Being full of iron minerals and heavy, the black crust sinks lower into the molten stuff below than the light-weight crust. Rain water pours off the highlands of the high crust and flows into the lowlands underlain by black rocks - thus form the oceans, underlain by sunken heavy rock, interspersed with continents of lighter crust floating on the sea of dark molten stuff below. All is in motion - the dark iron-rich oceanic plates and the light granite, sand, and limey continental plates are shoved aside by the continuing hot surges from below. Geologists call this heaving, shoving crustal mess, Plate Tectonics (tectos - to build). --- T Well, back to the San Juans. The scenes from the South Pacific - shallow, tropical seas teeming with coral and shell, interspersed with volcanic outpourings on the sea floor - are moving! -- first northerly from the Equator and then easterly. Looming on the far-horizon sits the light-weight continental plate of North America, blocking passage. Our continent was smaller then. Its western margin would be hundreds of miles inland of today's coast. A giant marine dinosaur, basking on the continent's western shore, would have been somewhere near the location of today's Cascades (those mountains, by the way, didn't exist back then). Lifting his awkward head, glancing seaward, he would have seen an arc of islands offshore - similar to today's island arc of Japan. The moving sea floor plate, studded with island arcs and veneered with the effluvia of shells, sand and lime, was slowly but inexorably moving toward the continent. Finally it crushed against the great mass of North America. The heavy sea floor shrugged, folded, cracked and slid ponderously below the high-floating continent. The stuff piggy-backing along on the sea floor plate was scraped unceremoniously off the plate and plastered against the margin of the continent. --- T That marine dinosaur's progeny, shaken by earthquakes from the collision, would now laze on the newly accreted land, with a shoreline many miles to the west of where its ancestor hung out. The continental margin had grown outward. In fact, it has been doing so through a similar process for hundreds of millions of years. Now, many years later, the Cascades would have been erupting inland from the new continental margin but that's another geologic tale. --- T The stuff of the San Juan Islands, then, is the scrapings off a sea floor plate, heaped up along the western edge of North America. Geologists have mapped six terranes in the San Juans, each terrane a relatively distinct mélange of sea floor stuff, separated from each other by faults where a later arriving plate would suture itself to the continent. 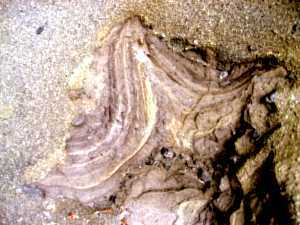 The force of collision was sometimes severe enough to alter the rock types through heat and pressure (metamorphism). 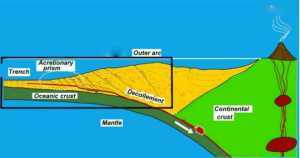 The continental margin was deformed, bent, and broken by the arrival of a new terrane. --- T One of the latest arriving plates brought the rocks that comprise the terrane now known as Vancouver Island, and another brought us the glorious Olympic Peninsula. Oh, and by the way, the sea floor plate (Juan de Fuca Plate), continues to slide under Oregon, Washington, and British Columbia today. On a scale of 0(low) to 5(high), coastal Washington is a 5 in probability of hazard from large-scale earthquakes. Tsunami deposits have been mapped well inland along the coasts, some burying Indian villages, attesting to the power of recent earthquakes. --- T The story isn't over yet. The last part of the tale is one of ice. Beginning about 2 million years ago, earth markedly cooled. More winter snow fell on the continental interior than could melt in the summer. The weight of accumulating snow altered snow into ice. The mound of ice grew to great heights (over a mile high) and soon oozed outward in all directions under the force of its own gravity. The mound coalesced with other accumulating ice piles, and soon glaciers of continental proportion covered most of the northern portion of North America. --- T Here, in the Paific Northwest, ice flowed down from the mountainous continental margin and merged with the continental ice sheets. 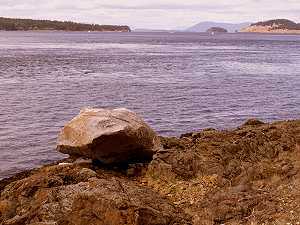 Almost all the rock along the continental margin of Washington, British Columbia, and Alaska was shaped, ground, molded and or moved by glacial ice. Soft material was scraped away and dumped; resistent hard rock was scoured, scratched, shaped and often worn away. The result was a new landscape -- with deep fjords, serrated mountains, and broad valleys. 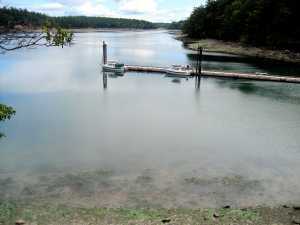 --- T Liquid water was also a major actor in changing the scenary of the Northwest. Earth has a finite amount of water, and like any home budget, if one overdrafts one portion, another part must necessarily shrink. So it is with water. Put too much into ice, and sea level must fall. During these past few million years, in times of glacial advance, so much water was heaped on the continents and piled into ice shelves along continental margins, that sea level fell hundreds of feet. During many times of glacial advance, the islands of the Northwest weren't islands - they were coastal valleys and ridges open to the assault of moving continental ice sheets. --- T Now, during an interglacial time of global warmth, sea level is high. We cruise through straits and channels that yesterday, geologically speaking, were valleys. 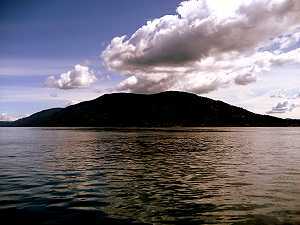 Today's islands are the former highland ridges. --- T Water continues to modify the landscape. 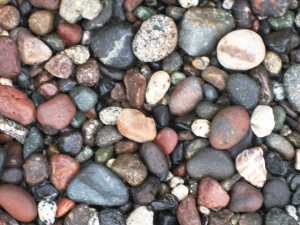 Rain water seeps into rock, loosening fragments, and washing them down to form the gravel and sand of beaches where waves mill the pebbles to powder. --- T Storm waves tear at the margins of the islands, gradually reducing them to reefs and islets. 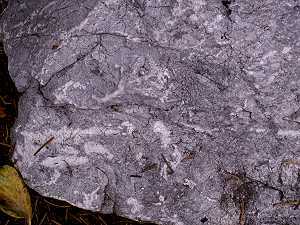 --- T Salt is also active in erosion. 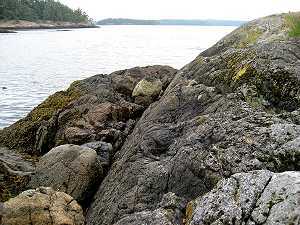 Sea water permeates coastal rocks. 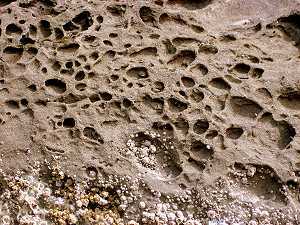 At low tide, or between ocean storms, the seawater or spray dries leaving behind crystals of pure salt in the rock pores. Repeated countless times, the salt crystals grow larger in the confined spaces or fractures of the rock. Beware of the power of a growing salt crystal! 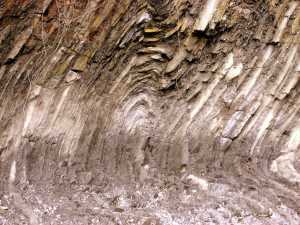 With a force rivaling that of a hydraulic machine, the growing salt crystal presses on the walls of the crack or pore and ruptures tiny fragment off the rock. --- T Through time, the shoreline rocks are fragmented and destroyed. The pebbles, sand and clay that rim the islands are the remnants left by water erosion and crystal destruction. 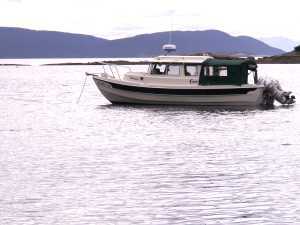 --- T It has only been about 14,000 years since the last ice left the islands, and remnants cling to the high mountain valleys and still reach tidewater in Alaska. As Nevadans we understand odds, and odds are the ice will return again in the geologic future. 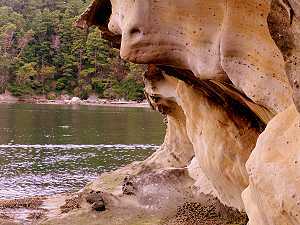 --- T But, in the meantime, we have the islands of the Pacific Northwest - treasures for cruisers. They are the remnants scraped off a sea floor plate, heaped up against the edge of a continent, scoured by ice and water and now loved by millions.